As some background, your humble E.O. Airlie has lived on three continents, and worked yet on another one, so I speak from the perspective of someone who has seen life beyond American shores. This is not a boast, but a plea to my fellow Americans to step outside our system and look at things from a different perspective. We have much to learn from the rapidly changing landscape of science, but we can not forget our shared American history, which is often best viewed through the lens of another culture. The United States of America has a unique origin, being one of the first democracies to emerge from under the yolk of European colonialism. However, we were the first independent nation which was based on shared values of the immigrant peoples that settled there, and not upon a shared ethnicity or language. The character of the USA would be set based on this independence struggle, and would persist for over 200 years based on shared values and a desire for unity. That unity is being challenged by a move away from out founding legend and an increased split between our social classes. The Stanford Center for the Study of Poverty and Inequality has some shocking statistics about how far we have moved from our initial national promise of “All Men Created Equal.” But I think the key is that economic inequality has always existed. We have “inequality” of almost all areas of American life, but I disagree that this is due to money alone. Wealth obviously plays a huge part in inequality, but in the long term social inequality is a far more pernicious force which truly threatens the future of America as a world leader. The cold facts are that we have a number of Americans who feel they are strangers in their own land. Ipsos polling shows the disturbing trends, although they are labeled pejoratively as “nativism” instead of more properly as “alienation.” Blood might be spilled purely for money, but it is more easily spilled when the target is not like you. Tax payers are especially frustrated by the so-called free riders who abuse the system. The feelings are often so strong that tax payers will end relationships and bring social stigma on themselves for calling out people who are getting financial assistance from the government under false pretenses. And we have less tax payers than we have had since WWII, as well. As Mitt Romney pointed out to his detriment, a stunning 46.4% of Americans pay no income tax. Most of those actually receive more money than was withheld from their paychecks at tax time. Now they pay some other taxes, including sales tax, and property tax, but their financial contribution to their homeland is disproportionally limited. Another divisive issue is the seemingly non-stop American military campaign which rages across North and Central Africa, through the Middle East, and stretches into the mountain-passes of Asia. America is in a shooting war in more countries under a President who won a Nobel Peace Prize, than at any time after WWII. In a somewhat dated story from the New York Times, no friend to conservative causes, the authors point out that less than 0.5 percent of the population serves in the Armed Forces. Less than 20 percent of Congress served in uniform. These numbers are also the lowest since WWII. So we are at war in more places with less warriors than ever before. This creates another barrier between the protectors and the protected. Police are also more militarized and less connected to the communities they serve. Their morale is catastrophically low not due to pay issues, but due to this spreading gulf. I assess that these problems are linked at their base – alienation happens because national sacrifices are not shared. Blood and treasure does not flow equally from American citizens. This ain’t how it was supposed be. The finance and defense of the nation were supposed to be burdens shared by all. So I propose a dual-track solution to the problem – everyone should serve, and everyone should pay. Both of these statements are controversial, and can be misconstrued, but they are based on the simple fact that people must be asked to sacrifice for their country if they expect to receive something from it. “Ask not what your country can do for you, but what you can do for your country,” as President John F. Kennedy was fond of saying. First, everyone should pay at least $1 in income tax. This may be a symbolic number, but would give everyone stake in the nation’s financial future. Secondly, everyone should have an opportunity to serve and die in wars for the nation’s defense. Not just 18-year old men, but everybody. National service would mean the end of an active duty military and the conversion of the entire armed forces to a Reserve/National Guard. The nation’s defense, or alternatively offense, would be provided by a trained cadre of citizen soldiers drawn from the entire population. Men, women, gays, straights, millionaires, poor people, old, young, lawyers, street-sweepers, Christians, and Muslims, would all be subject to conscription at any age, from any profession. The term would be limited, and would be primarily in a one-weekend-a-month status, but would be mandatory. No exemptions for Congressmen, talk show hosts, pacifists, Vermont Socialists, academics, or Senators’ sons. 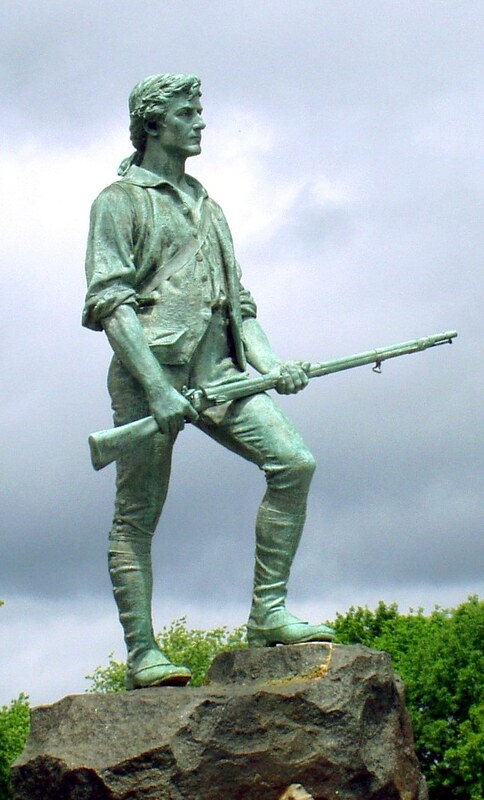 This wasn’t exactly when the founding fathers envisioned, but is much closer to their ideal than our current professional class of warriors. In short, I think our nation could be brought together with mutual sacrifice. It would strengthen those who feel alienated by showing them everyone else is in the same boat, and it would genuinely bring people who have been absent into the political and social conversation because they wouldn’t be able to avoid it. We have forgotten the lessons of our own history. Time is running out on the unity our forefathers created. 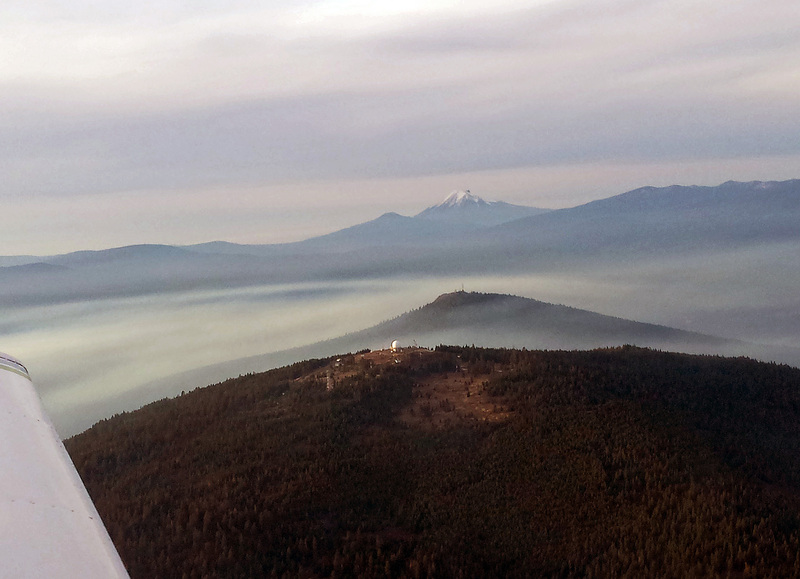 The last Friday I flew the short journey from Klamath Falls to Siskiyou County Airport. It was an ideal day for flying. There was not much traffic in the sky. The air was cool, which improved lift. There was very little vertical movement, so I didn’t bounce around much. Normally, I use VFR-flight-following. Air traffic control provides a transponder code so they can track the aircraft on radar. If another aircraft approaches, they will advise. On Friday, no one was in the area. I asked Seattle Center if I could go off frequency, do a touch and go at Big Siskiyou and return to the frequency. They said it was OK, so I retained my code and did not have to return to the system . As I was flying, I looked over Hamaker Mountain and saw Chase Mountain and Mount McLoughlin lining up. The visual was impressive because the mountains appeared to be floating among the ground fog, mist, and smoke. I pulled my camera out and took a shot. After landing and putting the Piper Warrior away, I checked the pictures and thought the shot above was particularly interesting. Flying is not inexpensive, but pound-for-pound, it provides more exhiliration than other efforts. Normally, when I am driving home, I have a smile on my older face.